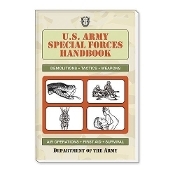 This handbook reveals the techniques and tactics that make the U.S. Army Special Forces some of the most elite and highly skilled soldiers in the world. Trained to succeed in specialized operations such as reconnaissance, unconventional warfare, and counter-terrorism, these soldiers undergo a rigorous selection process and operate under the principles of self-sufficiency, stealth, speed, and teamwork. Here readers will discover how guerrilla forces differ from special forces and how unconventional warfare relates to both; how to conduct a raid; how to improvise explosive devices; and how special forces carry out air operations. By the U.S. Department of the Army.